With the heightened awareness about energy consumption in households, consumers have placed an even greater emphasis on energy performance. The only problem is that your window's energy performance itself is invisible. The Window Energy Profiler and Sales Brochure help you make the invisible energy performance of your window real to your customers. Many salespeople have the bad habit of selling product features instead of the benefits a product can provide for a consumer. But the Sales Brochure clearly lays out the advantages and benefits of controlling SHGC, blocking damaging UV rays and allowing the right amount of Visible light into the home. Most importantly, it explains these often times confusing concepts and explains them in a clear and consise manner. The Sales Brochure doesn't have your logo on it, as it was made by EDTM - not your company. The Sales Brochure acts as an impartial 3rd party observer that helps sell good window performance - not a particular window brand. 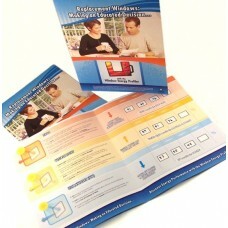 If your window performance is a selling point, you should be selling it with the Window Energy Profiler Sales Brochure. We designed the Sales Brochure to give your customers an indication about the performance of your window from an unbiased source. If that's not what you're looking for, and you would prefer to customize the brochure with your own brand, call (419) 861-1030 for custom quoting. We'll do our best to produce a brochure that fits your needs. The beginning of your product demonstration is the perfect time to take a few minutes and teach your prospects about the most important performance characteristics involved in choosing a window. Get on the same page with your prospect now, so you don't get into the demonstration only to realize the prospect doesn't have a clue what you are talking about. Just tell them: "Before we go on, I want to make sure you fully understand the terms we're going to be using in the demonstration. Let's take a look at this brochure and make sure we're on the same page." Once they understand what SHGC, UV and Visible performance mean and whether they want their windows to have high or low values for each (this is clearly explained in the brochure), it's time to start demonstrating performance with the Window Energy Profiler. You can start by testing your customer's current windows. Then move on to some other glass samples and end with a sample of your window. As you test the window and samples, record the performance numbers on the worksheet area of the brochure (inside right page). The brochure clearly lays out whether your customer should want high or low values for each measurement, so you can easily point out how your window outperforms their current windows or the samples of other glass on the market. Mega Kit Save Over $500 Off the Price of Tools Purchased Individually! The MK1221 MEGA-KIT includes all of the most popular products offered by EDTM. With the included tools, you will be equipped for an extensive array of applications. By purchasin..